Students, faculty and administrators for the Cal-Bridge North program pose for a photo. 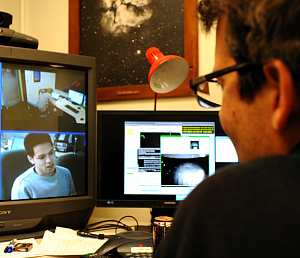 Cal-Bridge scholars prepare to apply for PhD programs in physics and astronomy. SAN JOSE, CA– San Jose State University joins a consortium of 15 California State University (CSU) and nine University of California (UC) campuses collectively awarded a five-year, $5 million grant from the National Science Foundation to dramatically increase diversity within the fields of physics and astronomy through the Cal-Bridge program. The Cal-Bridge program launched four years ago. 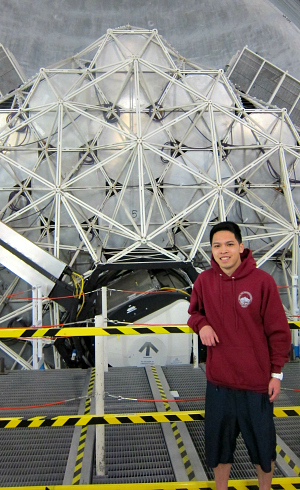 It creates a pathway for underrepresented minority students from multiple CSU campuses to gain the experience needed to apply for doctoral programs in physics and astronomy at UC campuses across California. Currently, students from underrepresented minority groups represent 30 percent of the U.S. population, but represent less than 4 percent of physics and astronomy PhDs recipients nationwide. The national average of underrepresented minorities, or URM students, earning a PhD in these fields is about 80 per year. 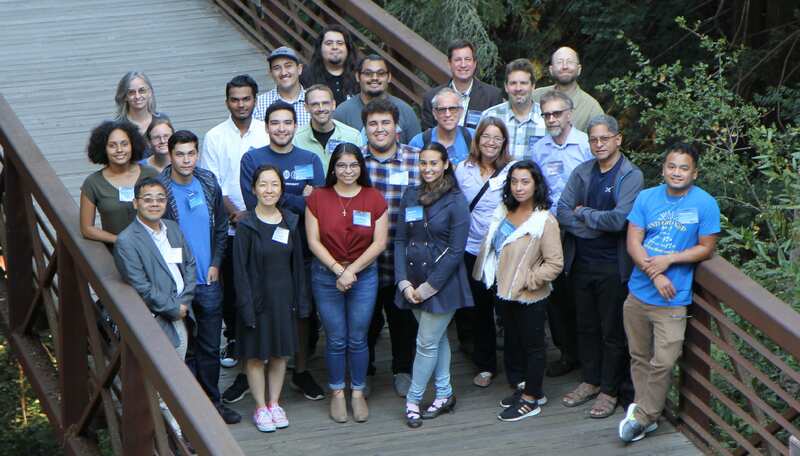 The recent grant allows Cal-Bridge to expand from about a dozen scholars per year to as many as 50 statewide, with the addition of students from SJSU, San Francisco State, CSU East Bay and CSU Sacramento. 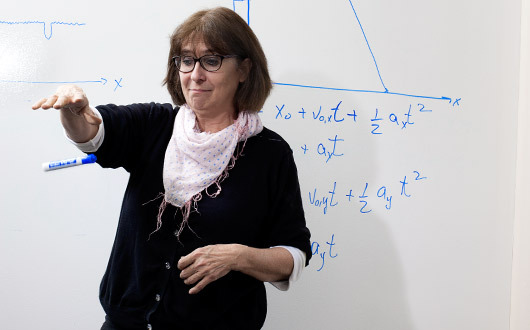 SJSU is serving as a lead institution for Cal-Bridge North, with the support of Romanowsky and College of Science Dean Michael Kaufman, former chair of the Department of Physics and Astronomy. 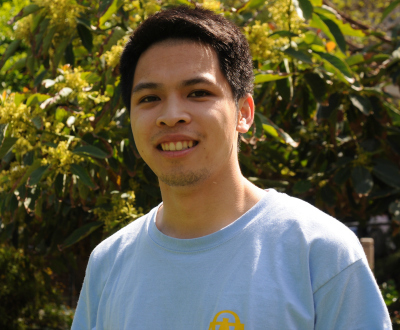 SJSU students Jean Donet and Javier Bustamante joined the first cohort of Cal-Bridge North. 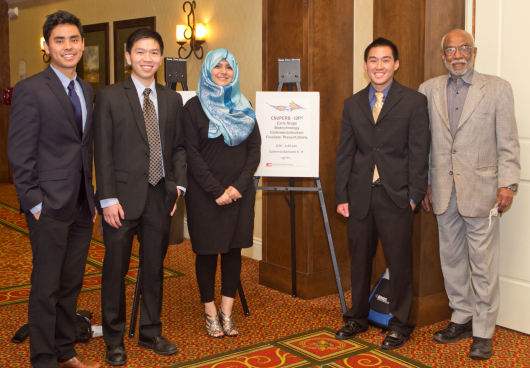 Participating Cal-Bridge Scholars receive a full scholarship for the final two years of their undergraduate degree, based on demonstrated need; a year of scholarship funding to cover the first year of graduate school at a participating UC campus; mentoring from faculty members at both CSU and UC campuses; professional development opportunities and research opportunities. 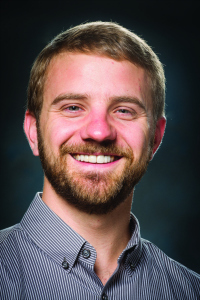 Cal-Bridge is led by Principal Investigator and Director Alexander Rudolph, a Cal Poly Pomona professor of physics and astronomy. 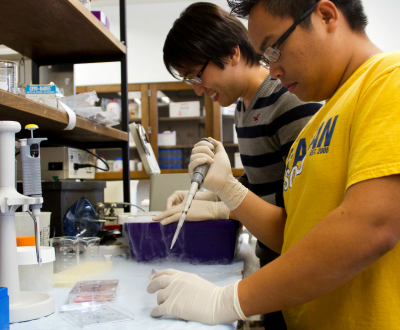 Cal-Bridge Scholars are recruited from the 15 CSU campuses and more than 30 community colleges in the Cal-Bridge network, with the help of local faculty and staff liaisons at each campus. The program has been highly successful in its first five years in developing a pipeline of highly diverse, qualified scholars, many of whom have already successfully matriculated to a PhD program in physics or astronomy. The program just selected its fifth cohort of 27 scholars from 10 different CSU campuses across the state, bringing the total number of scholars to 61 in five cohorts, including 35 Latinos, seven African-Americans and 27 women (16 of the 27 women are from underrepresented minority groups). In the last three years, 19 of 21 Cal-Bridge Scholars who have earned their bachelor’s degree in physics have begun or will attend PhD programs in physics or astronomy at top programs nationally, including UC Irvine, UC Santa Barbara, Harvard University, Northwestern University, the University of Maryland, Michigan State University and Penn State University. 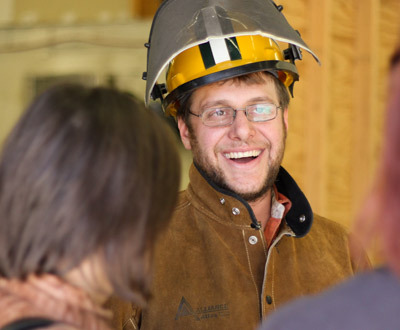 Learn more about Cal-Bridge and watch a video about the program online. 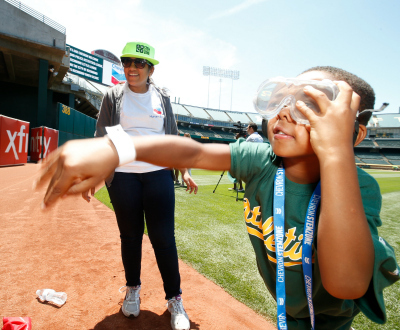 Gurdeep Soi, ’15 Electrical Engineering, helps a Richmond Little League baseball player with a hands-on exercise illuminating the science of sports (image courtesy of Chevron). 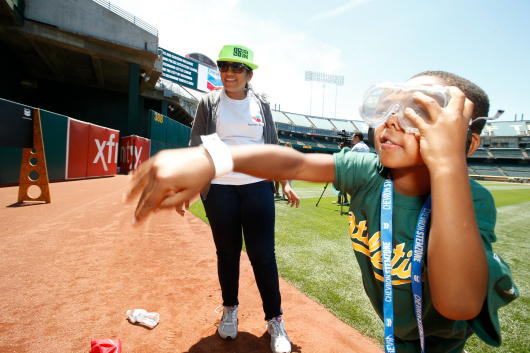 SJSU, the Oakland A’s and Chevron collaborated on a summer clinic June 30 designed to inspire Little League baseball players to take an interest in science, technology, engineering and math (STEM). 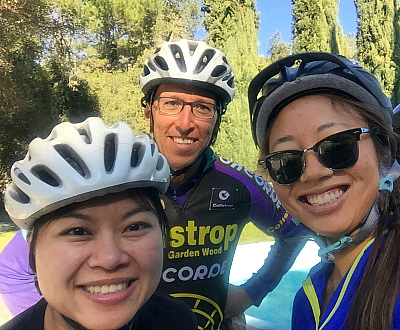 The SJSU students served as volunteer mentors, through the Jay Pinson STEM Education Program. The clinic featured Baseball Hall of Famer Tony La Russa, pitching great Vida Blue, and more than 100 Richmond Little League players at the O.co Coliseum. Spartans helped youngsters with hands-on activities and instruction in the Chevron STEM ZONE. The project is part of Chevron’s commitment to equipping youth with the critical skills they will need to succeed in jobs of the future. 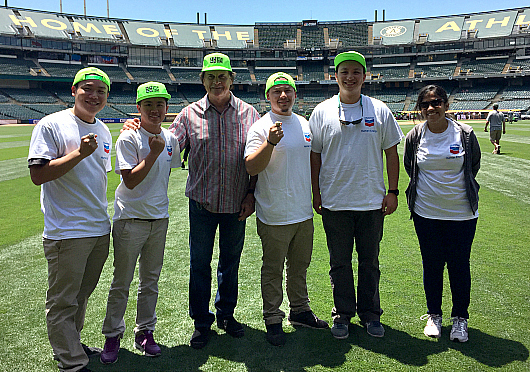 SJSU student volunteers, from left to right: Puyun Yen, ’17 Mechanical Engineering; Kennis Ko, ’16 Chemical Engineering; Baseball Hall of Famer Tony La Russa; Alex Zavala, ’17 Computer Engineering; AmeriCorps volunteer Philip Ye; and Gurdeep Soi, ’15 Electrical Engineering. Photo courtesy of the Jay Pinson STEM Education Program. SAN JOSE, CA – SJSU Professor of Biological Sciences Julio Soto will receive a Presidential Award for Excellence in Science, Mathematics, and Engineering Mentoring, the White House announced March 27. 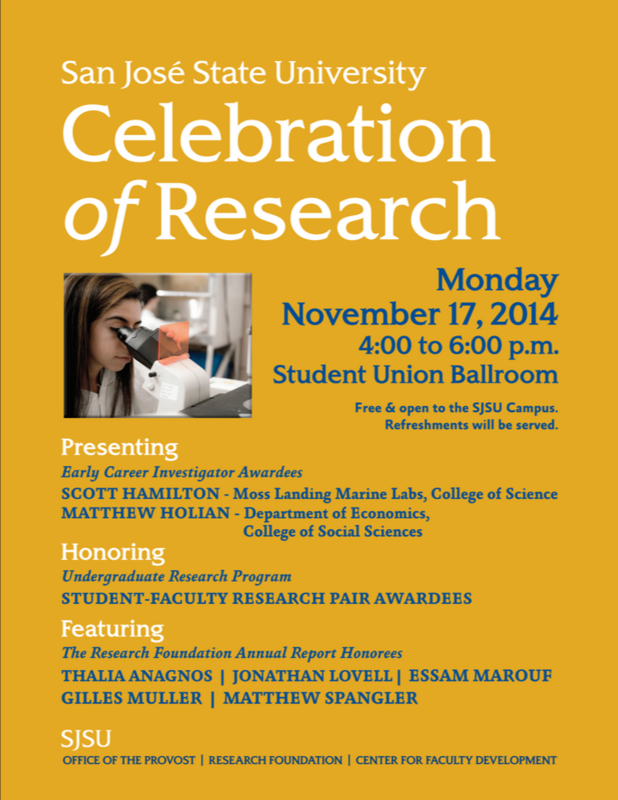 The honor, received by just 14 individuals and one organization in the past two years, recognizes the crucial role that mentoring plays in the academic and personal development of students studying science and engineering—particularly those who belong to groups that are underrepresented in these fields. Among his students inspired in the classroom to take part in the summer research program is Pareet Raju, ’15 Molecular Biology. “Dr. 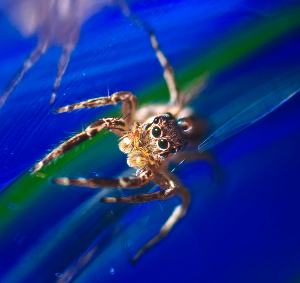 Soto helped me understand the lecture by providing research articles as a reference…Recently I joined his lab, where he has been guiding me through my research project,” she said. 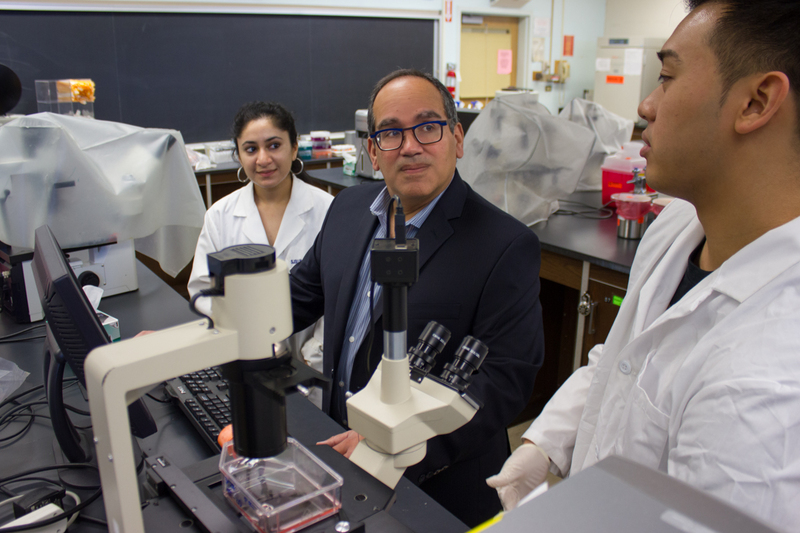 “As a member of an under-represented minority group, I am committed to making the unlimited intellectual possibilities of modern biology accessible to all students,” Professor Soto said. 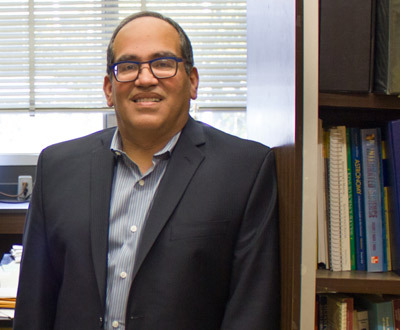 Soto arrived at SJSU in 1999, with degrees from the University of California, Berkeley, Texas A&M University-Kingsville, and the University of Puerto Rico at Cayey. 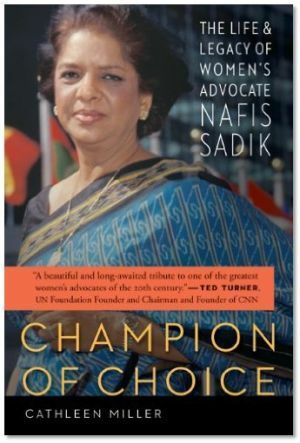 In addition to being honored in Washington later this year, Soto will receive an award of $10,000 from the National Science Foundation. 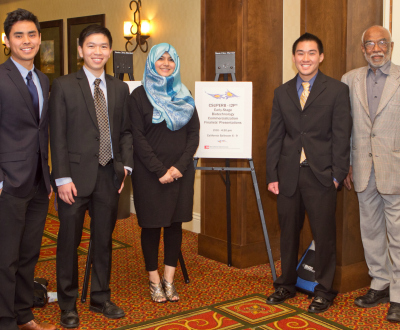 The mentors and organization announced March 27 represent the winners for 2012 and 2013. 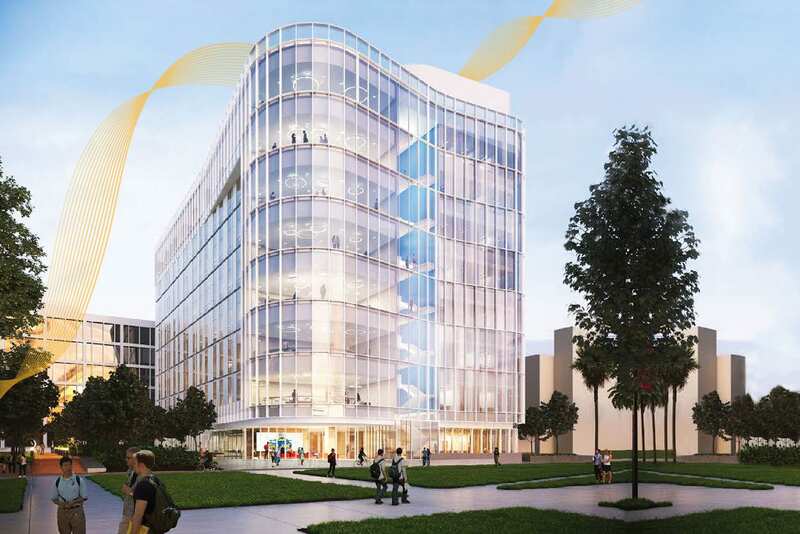 San Jose State—Silicon Valley’s largest institution of higher learning with 30,000 students and 3,740 employees—is part of the California State University system. SJSU’s 154-acre downtown campus anchors the nation’s 10th largest city. Did you know some wild birds turn their eggs 50 to 60 times a day during nesting season? Or in some species, the temperature of an egg inside a nest drops about 2.5 degrees from day to night? 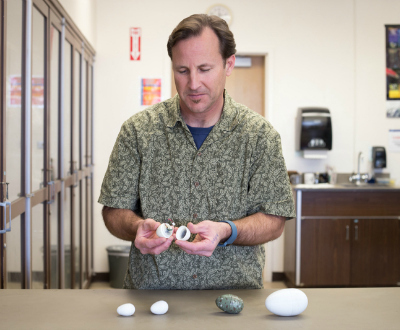 Those are just some of the findings Associate Professor of Biological Sciences Scott Shaffer discovered during recent studies with his new high-tech egg loggers. “The egg loggers open up a lot of new territory to explore what the birds are doing,” said Professor Shaffer, a wildlife biologist in the College of Science. The egg loggers look like real eggs, but they’re far from it. The eggs are plastic, and made on a 3-D printer. Inside are micro-electronics similar to those used in smart devices such as tablets and cell phones. An accelerometer and magnetometer measure motion and angle changes in three dimensions, and a thermistor monitors temperature. Each sensor takes a reading every second, and gives researchers more definite estimates to calculate three-dimensional movements, and create 3-D animations of movement patterns, something not available until now. Egg turning is critical for embryonic development in most bird species. The information provided by the egg loggers could help researchers learn how to improve hatching rates of artificially incubated eggs. In addition, researchers are seeking to better understand how man-made disturbances affect hatching success, and even learn how birds laden with certain contaminates like mercury influence hormone levels. 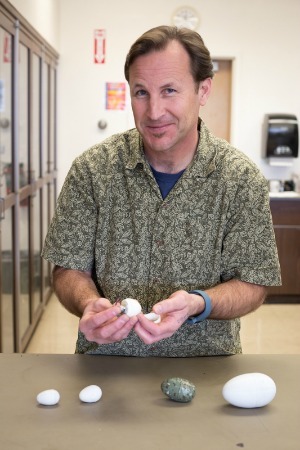 Shaffer and his team developed advanced egg loggers and placed them in the nests of five different-size bird species in geographic locations ranging from the tropics to Antarctica. The research was funded in part by the California State University Program for Education and Research in Biotechnology (CSUPERB). 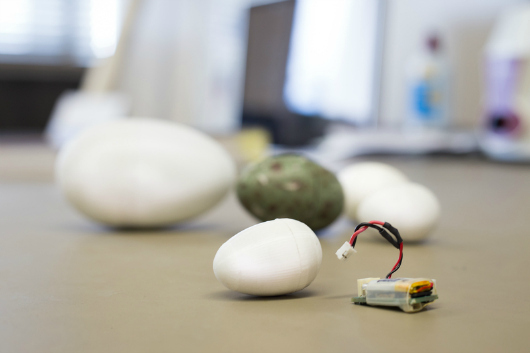 The egg loggers look like real eggs, but they’re far from it (photo by Muhamed Causevic, ’15 BFA Graphic Design). “From an ecological view, my long-term goal is to investigate whether birds turn their eggs differently based on the number of eggs in a nest, nest type, age and experience of parent birds, or breeding environment,” Professor Shaffer said. Bio-logging technology has been used since the mid 1960s, but rapid changes in microprocessors have reduced component size and increased the sophistication of senor technology. “It allows us to study wild animals in ways that weren’t possible 30 or 40 years ago,” Shaffer said. 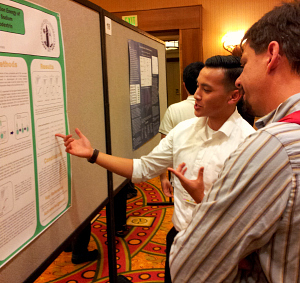 Ahn Pham and John Kim conducted walnut research at SJSU. Today, Pham is working in the biotechnology industry. 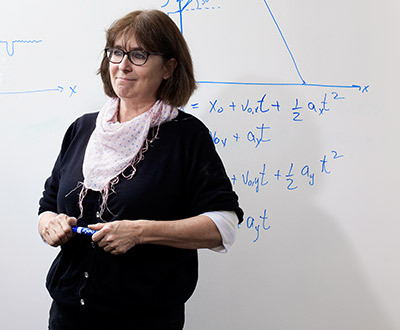 Kim is in a doctoral program at the University of Southern California (Dillon Adams photo). San Jose, CA–Walnuts are part of a Mediterranean diet and have been shown to reduce heart disease and are potentially able to fight cancer. Yet as much as science has revealed about the health benefits of walnuts, which components of walnuts are responsible for these effects has remained a mystery. Researchers at San Jose State University, in collaboration with scientists at North Carolina State University’s Plants for Human Health Institute, have now identified compounds that show anti-cancer effects in human breast cancer cell models. The research study, “Cytotoxic Effects of Ellagitannins Isolated from Walnuts in Human Cancer Cells”, was published online in September (Volume 66, Issue 8) in the scientific journal, Cancer and Nutrition. 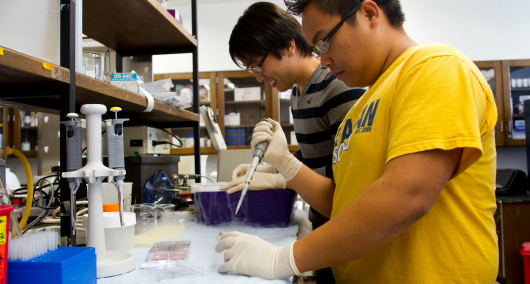 A team of undergraduate students at SJSU in the labs of Assistant Professor of Biological Sciences Brandon White and Professor of Chemistry Roy Okuda conducted the study characterizing the effects of the compounds on various breast cancer cells. Mary Grace, a senior researcher in Mary Ann Lila’s lab at the Plants for Human Health Institute, provided purified compounds that were used in this study. 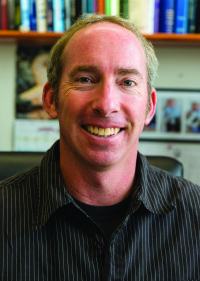 “Not only is this research beneficial to human health, it has also given students at SJSU an opportunity to work in the cancer biology field,” Professor White said. 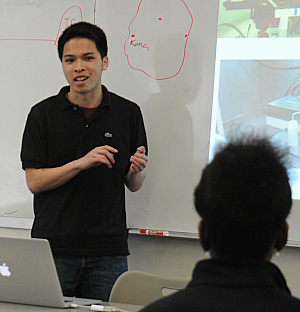 The student researchers were Vy Le, ’14 Biology; Danny Ha, ’14 Biology; Anh Pham, ’12 Biology; Anthony Bortolazzo, ’14 Biology; Zackery Bevens, ’14 Biology; and John Kim, ’12 Chemistry. Walnuts are the second largest nut crop in the United States, which produces over 900 million pounds annually with a production value of more than $1 billion. The U.S is the world’s largest exporter of walnuts. Walnuts are also sources of omega-3 fatty acids, vitamin E, and antioxidant compounds associated with heart health. “Identifying which compounds are active individually or synergistically will provide valuable insight into understanding their mechanisms of action. By gaining a better understanding of the unique properties of walnuts and how they promote human health, researchers may one day be able to target certain ailments by recommending consumption of walnuts,” Professor White said. 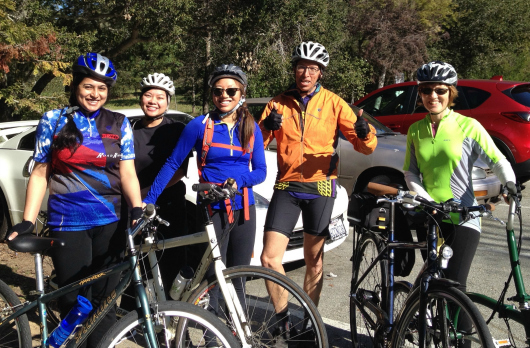 The California Walnut Commission provided funding support for this research project. 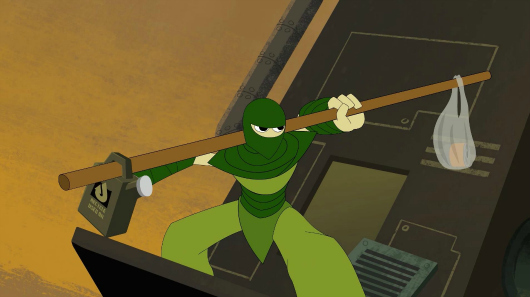 The Green Ninja takes action with recycled oil (Green Ninja Project image). 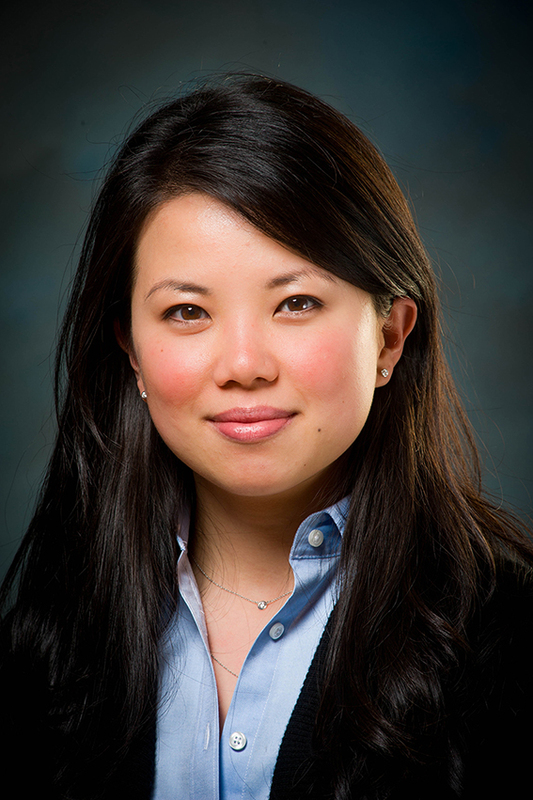 SAN JOSE, Calif.— San Jose State’s Green Ninja Project is one of four endeavors to receive a 2014 Science Technology Engineering and Mathematics Innovation Award from the Silicon Valley Education Foundation. The project will be recognized during the foundation’s signature annual event, Pioneers & Purpose, on Oct. 1 at the Fairmont San Jose. “These organizations represent the best in the country working to provide STEM experiences that strengthen and inspire students to explore their curiosity in STEM fields,” Silicon Valley Education Foundation CEO Muhammed Chaudhry said. 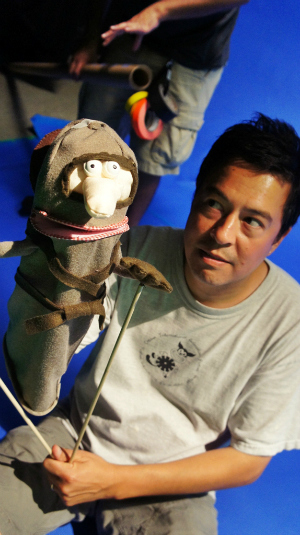 “The Green Ninja Show” features animation, live action and puppetry (Green Ninja Project image). The national award recognizes pioneering programs that have demonstrated innovative methods in STEM education and includes a cash prize. The Green Ninja Project uses a collection of humorous films and hands-on learning experiences to help young people develop the inspiration and tools to do something about our changing climate. 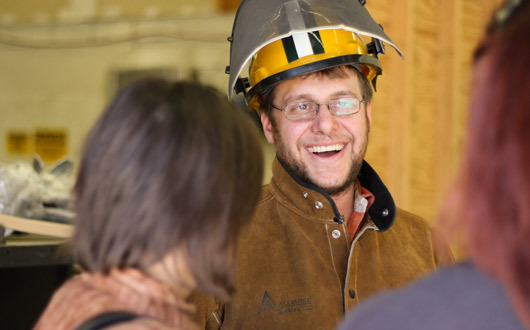 “By blending science, engineering and the arts, the Green Ninja Project aims to become a nationally recognized icon for education and action on climate change,” said Professor of Meteorology and Climate Science Eugene Cordero. The project is a multi-platform climate science education initiative that is driven by a strong collaboration between faculty members and students across various departments including Meteorology and Climate Science; Geology; Computer Science; Science Education; Primary Education; Television, Radio, Film and Theatre; and Animation and Illustration. 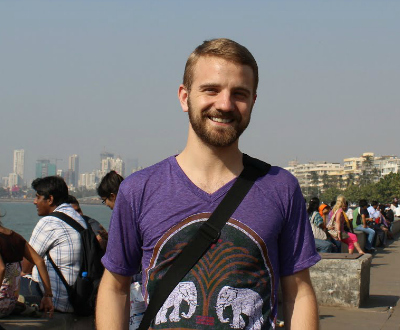 To date, the project has worked with more than 100 teachers and reached more than 2,000 students. 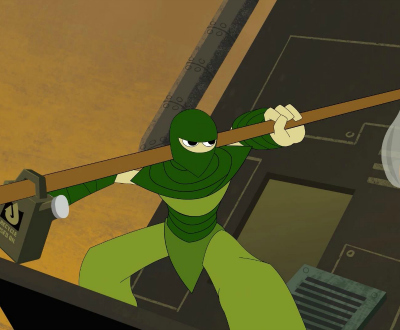 Episodes of “The Green Ninja Show” have had more than a million views on YouTube and TeacherTube. The $5,000 prize will support students working on the show’s second season. 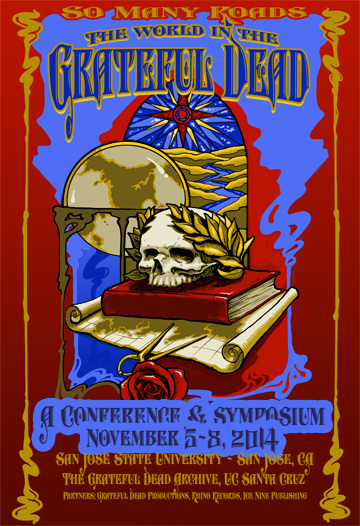 More than 70 camp participants will attend the Western Regional camp and the executive roundtable (Robert Bain photo). U.S. Cyber Challenge (USCC) and San Jose State University (SJSU) will host a cybersecurity roundtable discussion featuring national experts from technology, government and academia beginning at 11:15 a.m. on Tuesday, Aug. 12, at San Jose State University in the New Student Union Ballroom. 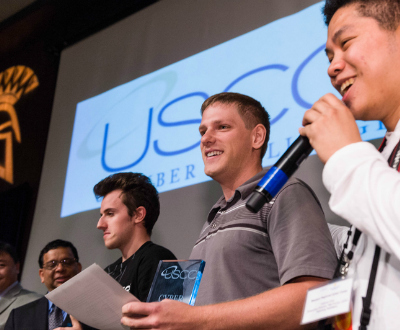 The event will be held in conjunction with the 2014 U.S. Cyber Challenge Western Regional Cyber Camp, taking place Aug. 11-15 at SJSU. The 2014 Western Regional Cyber Security Executive Roundtable Discussion will allow camp participants to hear firsthand from employers, including Silicon Valley companies, about how to prepare for a career in this critical field, as well as what specific roles these organizations hope to fill in their workforce. Executive participants include Dr. Ernest McDuffie, lead for the National Initiative for Cybersecurity Education (NICE); Darren Ash, Deputy Executive Director for Corporate Management and Chief Information Officer, Nuclear Regulatory Commission; Stuart Solomon, Vice President, Technical Services and Client Operations, iSight Partners; and Chris Bjornson, Chief Information Officer, Accenture Federal Services. Other participants will also include representatives from Facebook and (ISC)2. 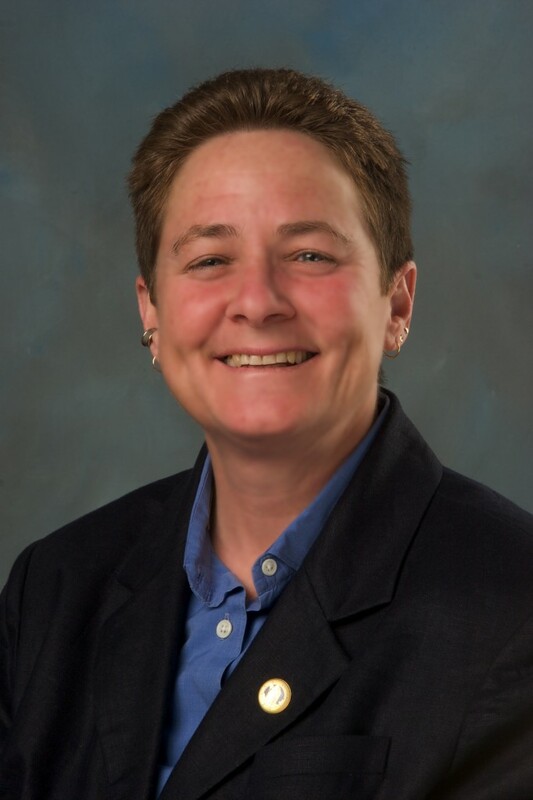 The roundtable will be moderated by Karen S. Evans, National Director of U.S. Cyber Challenge. Throughout the week-long camp program, curriculum includes in-depth workshops on a range of topics such as reverse engineering malware, writing exploits, tactical attacks and penetration testing, all taught by academics, SANS Institute senior instructors and other cybersecurity experts. The week will finish with a virtual “Capture the Flag” competition and awards ceremony Friday, Aug. 15, inside the New Student Union Ballroom. 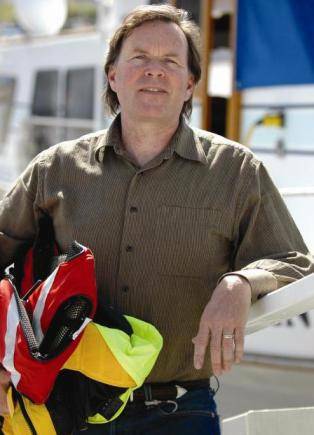 The ceremony will include remarks by President Qayoumi; Admiral Patrick Walsh, US Navy (Ret. 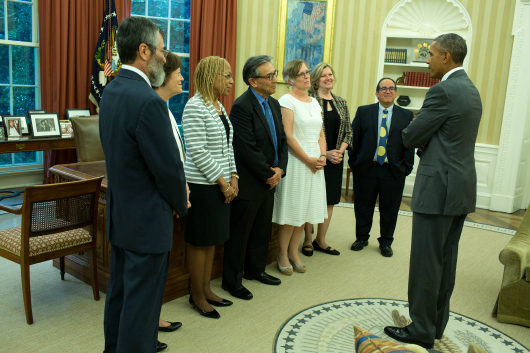 ), Senior VP, iSight Partners; and Karen S. Evans, National Director of U.S. Cyber Challenge. More than 70 camp participants are attending the Western Regional camp and the executive roundtable. 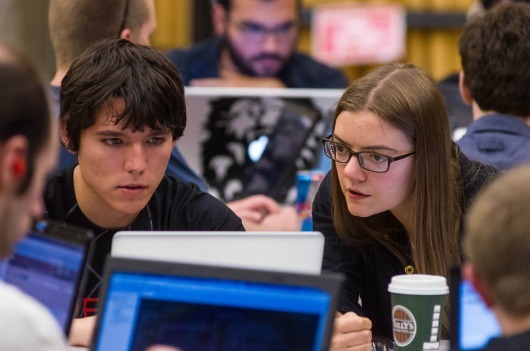 Attendees to the invitation-only camps were selected based in part on their scores from Cyber Quests, an online competition offered through the USCC in April that drew more than 1,600 participants from almost 700 schools nationwide. 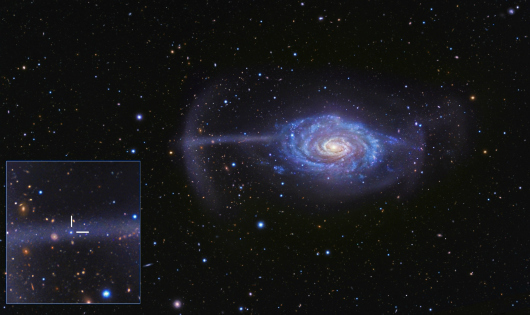 The Umbrella Galaxy takes its name from a mysterious feature seen on the left here, that is now found to be debris from a tiny galaxy, only a 50th its size, shredded apart by gravity. The image is a combination of data from the 0.5-meter BlackBird Remote Observatory Telescope and Suprime-Cam on the 8-meter Subaru Telescope. The inset shows a small cluster of stars embedded in the stream, which marks the center of the disrupted galaxy (image by R. Jay Gabany). MAUNA KEA, HAWAII – Scientists studying a ‘twin’ of the Milky Way have used the W. M. Keck Observatory and Subaru Observatory to accurately model how it is swallowing another, smaller galaxy, according to newly published research co-authored by San Jose State University assistant professor of physics and astronomy Aaron Romanowsky. The merging of small galaxies into larger ones is common throughout the universe, but because the shredded galaxies are so faint it has been hard to extract details in three-dimensions about how such mergers proceed. Using the most powerful optical facilities in the world, the twin, 10-meter Keck Observatory and the 8-meter Subaru Telescope, near the summit of Mauna Kea, Foster and her collaborators have determined enough about the character of the merger to provide a detailed model of how and when it occurred. The present work is a follow-up to a 2010 study, led by Dr. David Martínez-Delgado (University of Heidelberg), which used small robotic telescopes to image eight isolated spiral galaxies, and found the signs of mergers — shells, clouds and arcs of tidal debris — in six of them. DEIMOS (the DEep Imaging and Multi-Object Spectrograph) boasts the largest field of view (16.7 arcmin by 5 arcmin) of any of the Keck instruments, and the largest number of pixels (64 Mpix). It is used primarily in its multi-object mode, obtaining simultaneous spectra of up to 130 galaxies or stars. Astronomers study fields of distant galaxies with DEIMOS, efficiently probing the most distant corners of the universe with high sensitivity. 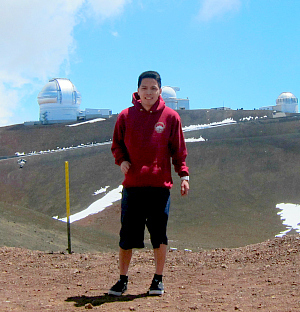 Keck Observatory is a private 501(c)3 non-profit organization and a scientific partnership of the California Institute of Technology, the University of California and NASA. 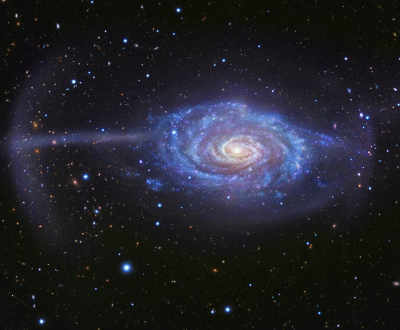 After taking panoramic images of the Umbrella with Suprime-Cam on Subaru, the scientists used the DEIMOS instrument, installed on the Keck II telescope, to map out the motions of the stream and hence determine how the galaxy is being shredded. The stars in the stream are incredibly faint, so it was necessary to use a proxy technique to measure the speeds of brighter tracer objects moving along with the stream stars. These bright tracers include globular star clusters, planetary nebulae (dying stars that glow like neon lights), and patches of glowing hydrogen gas.